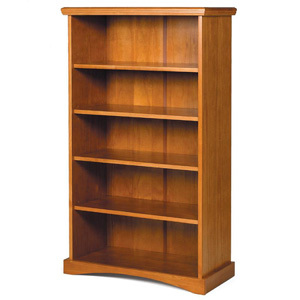 The five generous shelves of this pine bookcase offer great space for paperbacks, textbooks, trophies, and other collectibles. Wood & Finish	Solid pine with a honey pine, light pine, or chocolate stain and a protective lacquer finish. White laminate also available. Finish & Paint Options	Available in Chocolate finish, Honey Pine finish, or White finish.